When the world closed its eyes, he opened his arms. Once you find out what happened in Rwanda, you'll never forget. Oscar® nominee Don Cheadle gives "the performance of his career in this extraordinarily powerful" (The Hollywood Reporter) and moving true story of one man's brave stance against savagery during the 1994 Rwandan conflict. Sophie Okonedo co-stars as the loving wife who challenges a good man to become a great man. As his country descends into madness, five-star-hotel manager Paul Rusesabagina (Cheadle) sets out to save his family. But when he sees that the world will not intervene in the massacre of minority Tutsis, he finds the courage to open his hotel to more than 1,200 refugees. Now, with a rabid militia at the gates, he must use his well-honed grace, flattery and cunning to protect his guests from certain death. $100.091 thousand on 7 screens. 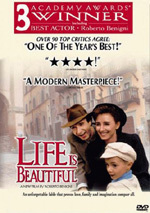 Every year the Oscars ignore at least one flick that sparks an outcry. For 2004, that flick was Hotel Rwanda. When it didn’t make the nominees for Best Picture, many folks asked how this could happen. Simple - it didn’t get as many votes as the five finalists. Did it deserve to beat out any of the flicks that earned nominations? Probably, but that’s partially because 2004 was a relatively weak roster of Best Picture contenders. Rwanda tells a powerful tale fairly well, but I don’t think it qualifies as a great film. Set in Kigali, Rwanda circa 1994, the film quickly informs us about the battles between the Hutus and the Tutsis. We learn that the Belgian colonists who once ran Rwanda created an artificial distinction between the natives. They selected the taller, lighter-skinned Rwandans to be Tutsis, which left the others as Hutus. The Belgians put the Tutsis in power until they left, and then the Hutus became in control of Rwanda. As the film starts, there’s a great deal of tension between the two sides, partially due to Tutsi rebels who fight against the Hutu extremist government. Many Hutus - encouraged by inflammatory comments on a radio station - favor the extermination of all the Tutsi “cockroaches” although the government will soon sign a UN-brokered peace agreement, and that’s where the movie begins. 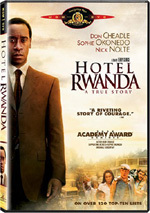 Rwanda focuses on the story of Paul Rusesabagina (Don Cheadle), one of the managers of a fancy hotel. Paul’s a Hutu, but his wife Tatiana (Sophie Okonedo) is a Tutsi. That will eventually create problems for the family. The movie follows the general movement toward violence and Paul’s journey. He starts as one who has faith that the various powers - the government and foreign peacekeepers - will prevent serious problems, and he doesn’t think he can do much. However, it soon becomes clear that the renegade Hutu militia wants nothing short of genocide and will kill any Tutsis they can find. It also becomes obvious that the outside forces can’t - or won’t - do much to halt the violence. Slowly pushed more and more into a corner, Paul uses his diplomatic skills to protect as many folks as he can. He uses the hotel as a de facto refugee camp, and he works with any means at his disposal to protect the hundreds of folks who hide out there. Prime among them is his family, as he struggles to keep them alive. 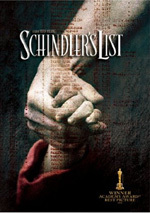 As I watched Rwanda, I couldn’t help but think it should have been titled Rusesabagina’s List. That doesn’t mean that I view Rwanda as a rip-off of the Spielberg flick, as it does tell its own story. However, serious parallels occur, as both feature many common elements. Many will disagree, but I think Rwanda offers the superior film. I didn’t like List largely because it was too manipulative and it suffered from no well-developed characters. Rwanda occasionally suffers from the first problem, as it often teases us with threats to Paul’s family, but the latter isn’t as much an issue. Actually, outside of Paul, I don’t think Rwanda offers rich personalities. Okonedo does a fine job as Tatiana, but it’s really a thin role. Tatiana has little to do in the movie and definitely isn’t a prominent character; she acts as minor support for Paul and little else. At least Paul himself presents a full-blooded personality. The movie beats us over the head with his reluctance to become involved in the situation, but it does allow the character to grow and develop into a real person. Despite the potential to go that way, Paul never comes across as a symbol or a saint. The casting of Cheadle helps. Cheadle has to be one of the five strongest actors working today, as the man can literally play almost any kind of role. It’s amazing to think that he can pull off so many different characters in various films with so little residue of his natural personality. He’s not a Tom Cruise who often seems like the same person; Cheadle can be wildly different people and bring them off convincingly. He allows Paul to develop naturally and avoids the broad histrionics that otherwise could mar the proceedings. As for the manipulative elements, those become a little heavy at times, though they never reach the levels seen in List. Frankly, the story-telling aspects of Rwanda are some of its weakest parts. We see some awkward exposition and jerky movement at times. The manipulation also gets a bit forced at times, as the film teases us with threats to Paul’s family over and over again. However, I won’t complain about these too much since I think they help put us in Paul’s shoes. These allow us to see the terror that frequently affected him. It’s a thin line between realism and manipulation, but the movie usually stays on the right side of things. Hotel Rwanda definitely offers a powerful tale, though occasionally in spite of itself. The movie lacks great coherence or smooth story-telling, but it allows the horror of the real tale to come through well. The emotion and strength of the material makes this a flick with a real punch. Hotel Rwanda appears in an aspect ratio of approximately 2.35:1 on this single-sided, double-layered DVD; the image has been enhanced for 16X9 televisions. Despite many positive elements, a number of concerns marred this transfer. Edge enhancement created the most significant problems. Many instances of haloes could be observed, and those led to a less defined image than I’d like. Most of the movie displayed solid resolution and clarity, but because of the haloes, wide shots often took on an indistinct tone. No jagged edges occurred, but I saw a little shimmering, and a smattering of print flaws also could be seen. Though I only noticed a speck or bit of grit here or there, these seemed a little too prominent for a brand-new movie. Colors functioned as the strongest element of the visuals. The movie used a lot of bright and dynamic hues that matched the African setting, and the transfer replicated those with vivacity. 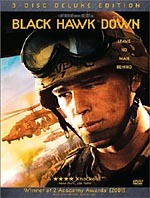 I was a little surprised the movie didn’t go for a stylized palette ala something like Black Hawk Down, but I was glad it didn’t, as the more believable colors made things realistic. While blacks looked deep and dense, low-light shots tended to seem a bit murky. Shadows were somewhat thick most of the time, and they didn’t offer great delineation. Too much of Rwanda offered very strong visuals for me to give it a grade below “B-“, but the flaws and inconsistencies nearly knocked this one down to “C” level. Although I discerned no serious flaws with the Dolby Digital 5.1 soundtrack of Hotel Rwanda, it also failed to merit a grade above a “B-“. Part of that stemmed from the mix’s general lack of involvement. Some of the violent sequences added dimensionality, but much of the time it seemed like a pretty restricted track, with little to create a feeling of atmosphere. Actually, that didn’t bother me much, as I didn’t expect a slam-bang mix. My larger complaints related to the awkwardness of the mix. The elements tended to be speaker-specific and they failed to blend cleanly. This mostly affected effects, as the score showed decent stereo delineation. However, the various effects usually popped up in one particular channel and didn’t mesh well with the rest of the mix. This wasn’t a terrible tendency, but it could cause distractions that occasionally took me out of the movie. At least audio quality was fine. Speech was consistently natural and distinctive, and I noticed no edginess or other concerns. Music demonstrated good range and clarity, as the score was bright and acceptably bold. Effects also came across well. They seemed clean and accurate, and they kicked in decent low-end material when necessary. Ultimately, the soundtrack was good enough to earn a “B-“, though the clunkiness of the soundfield almost put it into “C” territory as well. The DVD of Hotel Rwanda comes with a mix of supplements. First we find an audio commentary that mostly features director Terry George and the real-life Paul Rusesabagina, both of whom sit together for their running, screen-specific chat. Composer Wyclef Jean pops up briefly during the end credits. Along with George, he discusses the writing and recording of his song that plays at that time. If you want to learn much about the making of Rwanda, you’ll not get that here. At the track’s start, George tells us that he prefers to allow Rusesabagina to do most of the talking and he wants to focus on the facts. George does chime in about locations, liberties taken such as composite characters, and his decision not to feature graphic violence in the movie. Rusesabagina fills us in with the facts behind the film’s tale. He offers quite a lot of good details that broaden our understanding about the actions depicted. We learn many good notes about elements not depicted and how close the movie gets things. This nicely fleshes out matters and proves very informative, educational and enlightening. It’s a really fascinating piece. Unfortunately, the selected scenes commentary by actor Don Cheadle proves much less interesting. Cheadle offers screen-specific remarks that cover about 21 minutes and 47 seconds as jump around from scene to scene. Cheadle tells us a little about the production and his approach to the character, but don’t expect to learn much. Even with the abbreviated period covered by the track, there’s still a lot of dead air, and Cheadle’s notes tend to be bland and uninformative. Skip this nearly useless discussion. Next comes a 27-minute and 54-second documentary called A Message for Peace: Making Hotel Rwanda. This uses the standard complement of movie clips, archival material, and interviews. We hear from Rusesabagina, George, Cheadle, writer Keir Pearson, They discuss the story’s path to the screen and the development of the script, storytelling decisions and related issues, some of the facts behind the tale and thoughts about why the west didn’t assist, modern visits to Rwanda, casting and Cheadle’s approach to the role, more particulars of Rusesabagina’s activities, and what the folks involved hoped would result from the flick. Since it largely emphasizes Rusesabagina’s story, “Peace” duplicates some of the information already heard in the commentary. However, it opens up matters well. The title is deceptive, as there’s really not a lot about the making of the film, but we do get some good notes in that realm. Cheadle offers a lot more insight into his performance here than in his commentary. Despite some repetition and too many movie clips, this acts as a fairly informative piece. After this we locate a featurette entitled Return to Rwanda. In this 14-minute and 30-second piece, Rusesabagina heads back to his native country and revisits some of the spots featured in the film. He also narrates the program to discuss the locations and his activities. Some harrowing shots appear such as those that depict the corpses of those mauled back in the attacks. Rusesabagina gets into a surprising amount of new material and presents an involving and moving look at his past. In addition to the trailer for Rwanda, “Other Great MGM Releases” presents clips for Osama, , Manic, Bowling for Columbine and The Yes Men. The DVD starts with a trailer for Undertow and also presents a PSA with Don Cheadle to promote Amnesty International. It’s a good cause, but I dislike the fact you can’t skip the promo by any method; forcing me to watch the PSA every time I put in the DVD won’t make me give money. Despite some clumsy story telling and a few other awkward moments, the natural intensity of Hotel Rwanda allows the movie to succeed. With another excellent performance from Don Cheadle and a tale that packs a punch, the movie creates an involving world with emotional heft. As for the DVD, picture and sound seem fairly average, and it adds some good supplements highlighted by strong audio commentary. Rwanda doesn’t stand out as a DVD, but the movie and the whole package work well enough to merit my recommendation.